As suicide survivors, we have many beautiful Christmas memories, kept safely inside our hearts and memories. Each one is a moment in time that is very precious to us. The Christmas joy that we created with those we have lost to suicide and now remember, can never be taken away. Each year PIPS Hope & Support hold a memorial service for those who are concerned about or who have been touched by suicide. 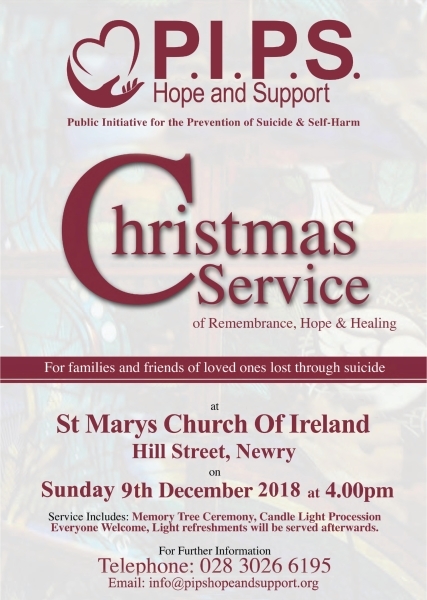 The service is open to everyone, and we warmly invite anyone bereaved through suicide to attend; it is a unique opportunity for people to come together in a spirit of comfort and hope. It is conducted in an atmosphere of peace and serenity, the service offers time to reflect, and remember loved ones. During the ceremony everyone has an opportunity to take part by either participating in the memory tree ceremony or the candle light possession or both. Because a suicide death is one of the most difficult to bear. With a single act, every relationship is irreparably affected. Grief is complicated by the feelings of anger, shame and guilt. Everyone is left with the nagging question, WHY? The pain for survivors is complicated. First, we mourn the loss of someone we loved. Second, we've experienced a sudden, typically unexpected traumatic death. And third, although the pain of loss demands relief, we may not know how, when or if we should express it. This is because society, friends and even extended family may be uneasy in dealing with suicide and its aftermath. Because of the stigma that surrounds suicide it has meant that over the years families and friends who have lost a family member or friend to suicide have not had the opportunity to share their grief in the same way that grief can be shared if death was other than suicide, The Christmas Service of Remembrance Hope & Healing helps the suicide bereaved to remember and cherish the lives of those lost to suicide. Anyone whose life has been touched by suicide is welcome to take part in the vigil," The service includes a candle light possession and carols, also a Memory Tree Service as well as readings, songs and personal reflections. The flame of the candle symbolises remembrance. As we light our candle in memory of our loved one, we do so with gratitude that they lived and that we shared their life for a time. During the service a guest speaker will give hope to those left behind by giving personal experience of his or her own personal journey after the death of a loved one to suicide this method of sharing hope will help them regain life and strength to be able to move on with their lives. Feedback from those who have attended previous Christmas services has been very positive, statements such as: very poignant and meaningful, extremely sensitive, opportunity to mix with other people to share similar experiences, opportunity at last to feel confident enough to speak about the loss, To know that I am not alone and that others can help me, great to know that there is something being done to help families bereaved.